A Sea Harrier FA2 of 801 NAS in flight at the Royal International Air Tattoo. The BAE Systems Sea Harrier is a British naval VTOL/STOVL jet fighter, reconnaissance and attack aircraft, a development of the Hawker Siddeley Harrier. It first entered service with the Royal Navy in April 1980 as the Sea Harrier FRS.1, and was informally known as the "Shar". The latest version is the Sea Harrier FA2. It was withdrawn from Royal Navy service in March 2006. In 1966 the planned CVA-01 class aircraft carriers for the Royal Navy were cancelled, apparently ending the Royal Navy's involvement in fixed-wing carrier aviation. However, beginning in the early 1970s, the first of a new class of "through deck cruisers" was planned, carefully named to avoid the term "aircraft carrier" to increase the chances of funding. These ships would eventually become the Invincible class aircraft carriers. With little modification, a 'ski-jump' was added to the end of the 170m deck, enabling the carriers to operate a small number of STOVL jets. Sea Harriers took part in the Falklands War of 1982, flying from the aircraft carriers HMS Invincible and HMS Hermes. The Sea Harriers were to operate in their primary air defence role with a secondary role of ground attack, with the RAF Harrier GR.3 providing the main ground attack force. The Sea Harrier squadrons shot down 21 Argentine aircraft in air-to-air combat with no air-to-air losses, although two Sea Harriers were lost to ground fire and four to accidents. A number of factors contributed to the failure of the Argentinian fighters to shoot down a Sea Harrier. Although the Mirage III and Dagger jets were considerably faster, the Sea Harrier was more manoeuvrable. Moreover, the Harrier employed the latest AIM-9L Sidewinder missiles and the Blue Fox radar. The British pilots had superior air-combat training, one manifestation of which was that they noticed Argentinian pilots occasionally releasing weapons outside of their operating parameters. British aircraft received fighter control from warships in San Carlos Water, although its effectiveness was limited by their being stationed close to the islands, which severely limited the effectiveness of their radar. Both sides' aircraft were operating in adverse conditions. Argentine aircraft were forced to operate from the mainland because airfields on the Falklands were only suited for propellor-driven transports. In addition, fears partly aroused by the bombing of Port Stanley airport by a British Vulcan bomber added to the Argentinians' decision to operate them from afar. As most Argentine aircraft lacked in-flight refuelling capability, they were forced to operate at the limit of their range. The Sea Harriers also had limited fuel reserves due to the tactical decision to station the British carriers out of Exocet missile range and the dispersal of the fleet. The result was that, although an Argentine aircraft could only allow 5 minutes over the islands to search and attack an objective and without any capable air-to-air missile, a Sea Harrier could stay near to 30 minutes waiting in the Argentine approach corridors. The Sea Harriers were outnumbered by the available Argentinian aircraft and were on occasion decoyed away by the activities of the Escuadrón Fénix or civilian jet aircraft used by the Argentine Air Force. They had to operate without a fleet early warning system such as AWACS that would have been available to a full NATO fleet in which the Royal Navy had expected to operate. The result was that the Sea Harriers could not establish complete air superiority and prevent Argentine attacks during day or night, nor could they stop the daily C-130 Hercules transports' night flights to the islands. A total of six Sea Harriers were lost to either ground fire, accidents or mechanical failure during the war. It was deployed by the United Kingdom in the 1991-1995 war in Bosnia (part of Yugoslav wars) as a part of the international operations Deny flight, and Deliberate Force directed against Army of Republika Srpska. In 1994 a Sea Harrier of the 801 Naval Air Squadron operating from the light carrier HMS Ark Royal was brought down by a SAM fired by Army of Republika Srpska (most probably Strela 2) while attempting bomb two Serbian tanks. The pilot, Lieutenant Nick Richardson ejected and landed in the territory controlled by friendly Bosnian muslims. He later described his experiances in a book titled "No Escape Zone"
It was used again in 1999 NATO campaign against Federal Republic of Yugoslavia (operation Allied Force). One aircraft was reportedly lost in an accident. The Sea Harrier was withdrawn from service in 2006 and the last remaining aircraft from 801 Squadron were decommissioned on March 29 2006. The plans were announced in 2002 by the Ministry of Defence. The aircraft's replacement, the Lockheed/Northrop/BAE F-35, is not due until 2012 at the earliest. However, the MoD argues that significant expenditure would be required to upgrade the fleet for only six years of service. Although the youngest Sea Harrier only joined the Navy in 1999, the FA2 is almost all metal, unlike the largely composite RAF Harriers.Template:Unclear Both versions of Harrier experienced reduced engine performance (Pegasus Mk 106 in FA2 - Mk 105 in GR7) in the higher ambient temperatures of the Middle East and this restricted the payloads able to be returned to the carrier decks in 'vertical' recoveries. Typically, in the era of 'Joint Force Harrier' combined operations in such theatres, the GR7 component detached from the carrier approximately two weeks before the Sea Harrier deck operations ceased. This was solely due to the safety factors associated with aircraft "land-on" weights. The natural option to install higher rated Pegasus engines would not be as straightforward as the Harrier GR7 upgrade and would likely be an expensive and slow process. 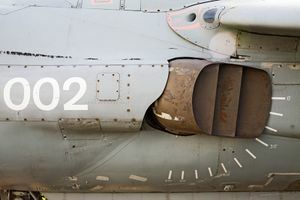 Furthermore, the Sea Harriers were subject to a generally more hostile environment than land-based Harriers, with corrosive salt spray a particular problem. As of March 2006, all Sea Harriers have been retired from service. A number of aircraft have been retained for use by the School of Flight Deck Operations at RNAS Culdrose, and in theory these could be regenerated if needed. OpponentsTemplate:Who? have argued that the loss of the Sea Harrier would leave the Royal Navy without effective air-defence capability for too long. The MoD argues that the Type 45 destroyer, due to enter service by the end of the decade will provide sufficient anti-aircraft warfare (AAW) capability. The Royal Navy's Fleet Air Arm will continue to share the other component of Joint Force Harrier, the Harrier GR7 and the upgraded Harrier GR9 with the RAF, with the two front-line squadrons, 800 NAS re-commissioned in April 06 and 801 NAS are expected to reform in 2007 both using the GR9 by 2007. The projected purchase of around 150 F-35s will be split between the two services and they will operate from the Royal Navy's Future Carrier (CVF). The Indian Navy is in the process of upgrading up to fifteen Sea Harriers in collaboration with Israel by installing the Elta EL/M-2032 radar and the Rafael 'Derby' medium range air to air missile. This will enable the Sea Harrier to remain in Indian service until beyond 2012 and also see limited service off the new carriers the IN will acquire by that time frame. One Sea Harrier has been acquired by a US Warbird operator and has been shipped to the US where it will join the US Air Show Circuit, a number of airframes are beginning to appear in Museums on static displays, and one has made its way in to the beer garden of the Snipe Public House in Dukenfield near Manchester. The RAF's Hawker Siddeley Harrier GR.1s had entered service in April 1969. In 1975 the Royal Navy ordered 34 Sea Harrier FRS.1s (Fighter/Reconnaissance/Strike), the first of which entered service in 1978. In total 57 FRS.1s were delivered between 1978 and 1988. The FRS.1 was largely based on the Harrier GR.3, but was modified to have a raised cockpit with a "bubble" canopy (to give better visibility for the air defence role) and an extended forward fuselage to accommodate the Ferranti (now BAE Systems) Blue Fox radar. Furthermore it was manufactured in alloys better suited for a maritime environment. Not a variant of the Sea Harrier but a two-seat naval training version of the Harrier T2. Four Harrier T4N were purchased by the Royal Navy for land-based training. It did not have radar and few Sea Harrier instruments, but was used for pilot conversion training for the Sea Harrier FRS1. Single-seat fighter, reconnaissance and attack aircraft. The Sea Harrier FRS 51 is similar to the FRS.1, but unlike the British Sea Harrier it is fitted with Matra R550 Magic air-to-air missiles. The first of twenty-three Sea Harrier FRS.51s were delivered to the Indian Navy in 1983. Export version of the T4N two-seat training version for the Indian Navy. At least four Harrier T60s were purchased by the Indian Navy for land-based training. Approval for an upgrade to FRS.2 standard was given in 1984. First flight of the prototype took place on September 1988 and a contract was signed for 29 upgraded aircraft in December that year, with the upgraded aircraft to be known as the F/A.2 (later FA2). In 1990 the Navy ordered 18 new-build FA2s, at a unit cost of around £12 million, and a further 5 upgrades were ordered in 1994. The FA2 featured the Blue Vixen radar, which was described as one of the most advanced pulse doppler radar systems in the world. The Blue Vixen formed the basis for development of the Eurofighter Typhoon's CAPTOR radar. The FA2 carries the AIM-120 AMRAAM missile and was the first UK aircraft to be provided with this capability. The first aircraft was delivered on April 2 1993 and the first operational deployment was in April 1994 as part of the UN force in Bosnia. The final new-build Sea Harrier FA2 was delivered on January 18 1999. Seven Harrier T4s two-seat trainers updated with Sea Harrier FA2 instrumentation but no radar. Retired from service in March 2006. Sea Harrier FA2 ZE694, Midland Air Museum, Coventry, England. The Harrier's unique characteristics have led to it being featured a number of films and video games. ↑ One of Our Aircraft is Missing, Britains-smallwars.com. ↑ Argentine Airpower in the Falklands War, Air & Space Power Journal, Fall 2002. Norden, Lon O. Harrier II, Validating V/STOL. Annapolis: Naval Institute Press, 2006. ISBN 1-59114-536-8. It uses material from the Wikipedia article "BAE Sea Harrier". This page was last edited on 18 April 2008, at 19:00.